The Friends of the Regis School of Music is a charity in its own right (Number 112 3595), with is own committee. It supports the Regis School of music in essential ways, such as providing bursaries for students, helping with essential maintenance of the building, and even raising funds for the procurement of instruments, such as the Yamaha Grand Piano that currently sits on our stage. 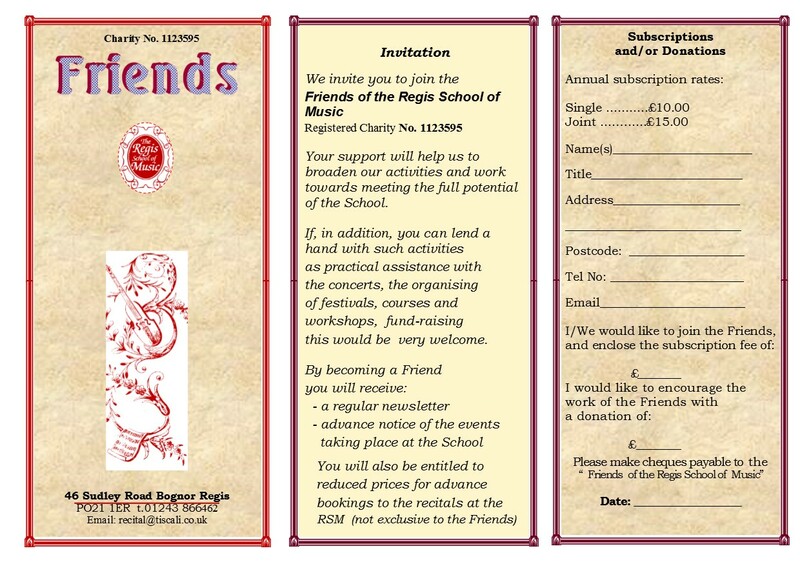 As well as supporting the Regis School of Music, the Friends also run a number of social and educational events for friends and guests. A series of talks and lectures on different topics, not necessarily musical, including coffee. Run approximately once every 6 weeks. Please see our Calendar of Events for upcoming talks. An event to help ease into the New Year, including musical entertainment, a buffet supper and excellent company! An event held in June to coincide with the launch of the Regis School of Music Summer Festival. A number of exciting new events are being planned - please do get in touch if you would like to join us, alternatively, simply download the membership form below, fill it in and send it back to us!